So, this whole Easter thing happened again. It seems to happen every year at some point in the Spring. Typically this day is marked by boisterous music, small girls clad in fancy dresses, and colorful eggs hidden in grass. While these hallmarks of the holiday are enjoyable and make for happy memories, they are not at the core of what defines Easter at Edgewood. Pastor Matt was back this week and he brought us a timely reminder of the significance of the truth we were there to celebrate. The discussion began with a question - "What is the most important thing?" The obvious churchy answer is something along the lines of "Jesus" or "the Gospel," but we were going deeper than that. We all know what we're supposed to say, but that's not usually where most of us live on a daily basis. There are plenty of priorities that require our attention, but only one thing is the most important. We can spend our time focusing on getting just the right programs organized or minimizing inconveniences in our lives, but ultimately none of it will ever be enough. So what is it? What is so important that we can root our entire existence in its reality? According to Paul in I Corinthians 15, the truth is this--Jesus died. He was buried, and he rose again on the third day just as the Scriptures had said. Without this reality, everything we as Christians claim to believe in is pointless. Without this reality, we are the most pitiful creatures on the earth. What is it that differentiates us from the rest of mankind? We know that it's real. Behind all the window dressing of special music, fellowship potlucks, and revival services--Jesus died. He was buried, and he rose again. As a child who discovers the impending egg hunt and rushes to find his playmate to give him the good news, so should we be basing our entire existence on the Truth. As a child who whispers excitedly, "There's candy! In eggs! Outside! All we have to do is go pick it up!" So are we with this reality that defies logic and reason in one pass. Jesus died. He was completely dead. Then they buried his body, and three days later he came back to life. This is so much better than candy hidden in eggs. So, as you walk away from this holiday please keep in mind the fact that the most important thing is not what we do. The most important thing has been done for us. Jesus died. 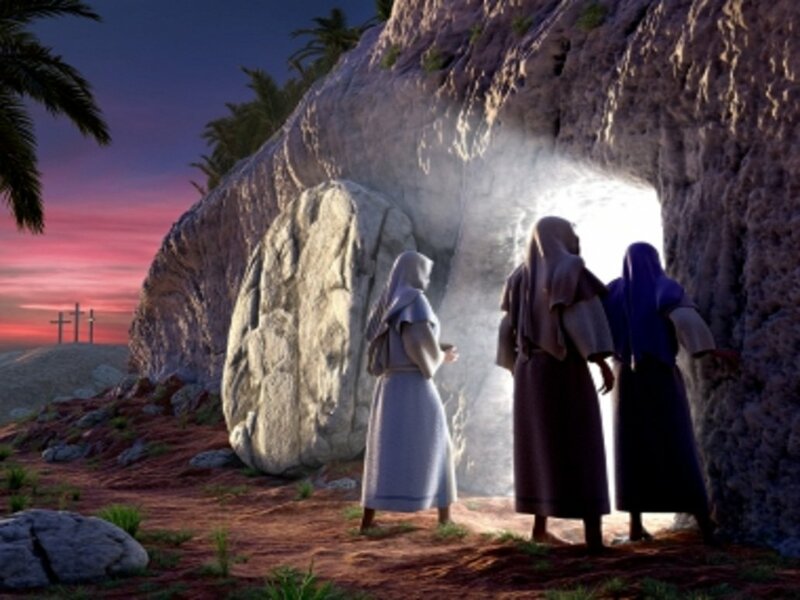 He was buried, and he rose again. This, and this alone, is the most important thing. 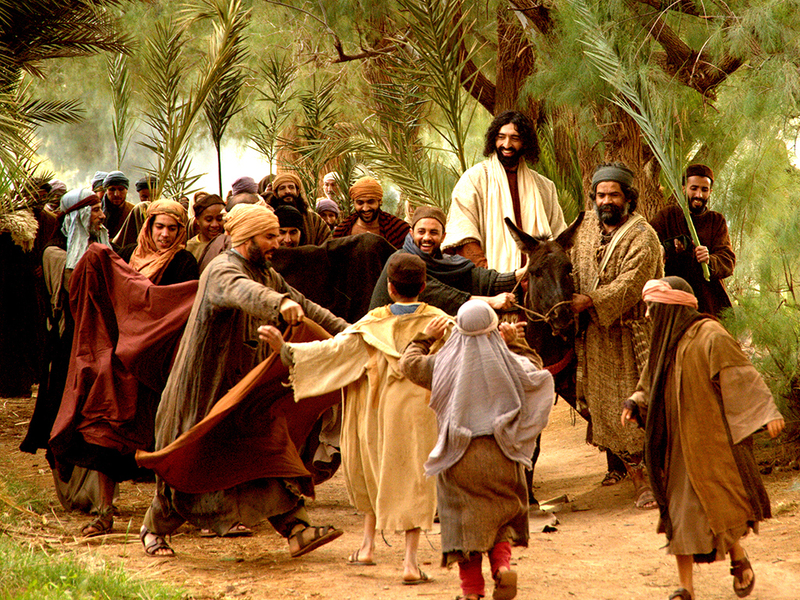 Our message this past Sunday was appropriately about Jesus' triumphal entry into Jerusalem on what we've come to call "Palm Sunday." With Pastor Matt and Charity away, we had Andrew Hager filling the pulpit. He and his family have been with us before a month or so ago when his wife Bethany came to present the Women's Care Clinic ministry to us. While most of us have probably heard of Palm Sunday before, we may not have known many of the cultural facts surrounding it that make it much more than a spontaneous worship service along the road. These are some of the details that Andrew drew our attention to, and it's amazing how dramatically they affect the way you read this account. So, Jesus is coming down the Mount of Olives on a colt. This is important, because it signifies that He is claiming to be royalty, and it also speaks to His coming in peace rather than war. Had He chosen a beautiful stallion, the meaning would have come across much differently. He purposely chooses an animal that is draped in clothing in such a way to declare His royalty. This is important, because He is completely aware of how this will communicate to the people who see Him. He rides majestically down the Mount of Olives and hasn't even reached the city limits of Jerusalem before people are coming out in droves to see Him and cry "Hosanna in the highest!" They are calling out all kinds of different phrases. They declare peace in heaven, and they glorify God. They truly believe He will deliver them, but they are perhaps pretending they see Him riding a horse instead of a colt. They throw their own clothing down on the ground to show honor to their "King" and eagerly show adoration. What happens next is incredibly telling though. When He reaches the outskirts of Jerusalem, He stops. In the middle of being heralded as Israel's King, He weeps for the rejection of the city. He knows that even as they praise Him as their King, they reject Him as their Messiah. He weeps at the future destruction of the temple; He knows what the outcome of their unbelief will be. So what did this tell us about ourselves? What did this tell us about God? We are not the people of Israel, and we have no temple. We can't see Jesus riding into town on a colt. How does this change the way we live and think today? Good question. Jesus wept over the city, not because they called Him their King. He was the one orchestrating the imagery in that scene. He wept because the people of Jerusalem wanted a King on their own terms. They wanted physical deliverance from Rome, and He was offering spiritual deliverance from their own sin. While they wanted a warring King ready to swoop in and drive back the Roman Empire, He was offering them the chance to be part of a Kingdom they could not understand. It was incredibly sad, because He knew that His mission would depend on their rejection. The salvation of mankind and the "blessing of all other families of the earth" would come through the children of Abraham all right, but it would be through the most horrific sin imaginable--the murder of God's only Son. We often want the same thing the Israelites did. We want Jesus, but we want Him on our own terms. We think it's great that we can believe in the Gospel, and somehow our lives will go exactly the way we want. We think that somehow we know what deliverance should look like. Deliverance looks like getting the job we want or having our family be healthy and happy. Deliverance is a comfortable life that doesn't hurt...right? Jesus says deliverance is on His terms, and often those terms are painful and difficult. A family member dies. A close friend goes through a painful divorce. Our job is eliminated. We get cancer or another serious illness. Whatever He chooses for us doesn't look exactly like we planned. We have to embrace the fact that the one who knows best what our deliverance needs to look like is Jesus Himself. He is vigorously working out His plan for our good and His glory in our lives, and that may not be the life we envisioned for ourselves. His disciples may have felt disappointed when they first saw hints that He was not going to immediately take back the land from Rome. But the deliverance He offered was and remains to this day--so much better than whatever we have in mind. Let's just take His word for it, ok?